During the pre-Valentine’s day #langchat, participants were sharing the resource love by talking about some of the best ways to incorporate native language speaking interactions into the classroom. Not only were some of the best online apps discussed, but the virtues of old-fashioned pen-pals were extolled and some excellent tips were shared from teachers who have years of experience managing native language speaking activities. Connecting with native language speakers is one of the most effective ways of getting students excited and personally connected to the target language. It’s one of the reasons why people have been using as a teaching tool for so long. Even though the technology has changed from simple pen and paper written interaction, the basic structure of incorporating these interactions is virtually unchanged from 100 years ago. Still, it can be a little tricky to set up and may require some effort on the part of the teacher. An updated version of the pen-pal system, this communication method hinges on creating “video diaries” to share with a classmate who lives in another part of the world. This is a great method, since it’s not reliant on time to manage the meeting. Instead, one classroom can create a “video diary” and send it to the corresponding class on their own time, instead of having to synchronize disparate schedules. The ultimate in native language exchange, this method actually connects students learning a language with native speakers in real time. There are many apps and software platforms that provide this kind of interactive experience. Although it is engaging for students, it can sometimes be difficult to combine schedules. Many teachers were excited to share their favorite platforms for synchronous video and text exchanges, such as SkypeClassroom, Twitter and Google+ Hangouts. Although they each have their own special benefits, the goal of each is to provide real-time communication that can inform the language learning process. Another standard method of encouraging native interaction with language students is by having speakers interact with them in person. These can be members of the community, language learners with more advanced skills or leadership figures. @SraSpanglish said, “I’ve invited Hispanic community representatives to give feedback on presentations in Spanish.” Other great guests include bilingual business professionals, college students and colleagues who have overcome language barriers to succeed in a second language. A great point was brought up, however. When including guest speakers in your classroom, make sure that both the students and the speaker are prepared to speak about a certain theme, topic or event to ensure that the interaction is focused and informative. One of the most unique methods of the night was the concept of service-oriented native language interaction. While @Bport_ModLangs shared their program that allowed students to interact with native language learners in their community, teachers like @SraSpanglish and @senoraCMT talked about sending aid, letters and packages to native speakers in needy countries. How Do I Connect with Classroom-Friendly Native Speakers? This exchange brought up an important component of using native speakers for language learning: How do you find individuals and classes to do exchanges with? What are the Best Technologies for Facilitating Language Interactions? So, what are these amazing communication platforms that all the language teachers are talking about? Actually, most of them are things that you probably already use in your daily life or in your classroom instruction. Skype is free and relatively easy to use across all types of browser platform. 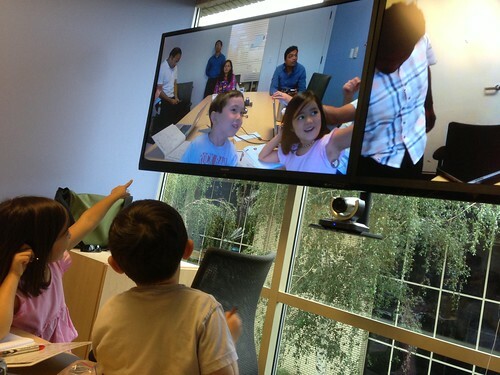 On the other hand, the free version only allows for video conferencing between two screens. Many teachers suggested using SkypeClassroom as an alternative, as it also has classroom connecting settings so that you can find the kind of classroom you want to communicate with. In addition, you can record the call and watch it later! Twitter is a completely live texting application that can be tailored to find trending topics and speakers in a target language. Not only is it a great way to find classrooms to connect with, but the 140-character limit means that students don’t have to stress about long, drawn-out conversations. @nico1e said, “If you tweet in a foreign language, it’s also a nice break from typical stress of writing “long sentences.” Teach les SMS/textos.” It is not allowed by all school district filters, though, and may require more teacher management than some apps with a higher level of internal security. How Can I Make Sure My Kids are Learning During Interactions? Some teachers had good suggestions for making sure that the language exchange was equal. Thanks so much to @msfrenchteach for taking charge of our conversation about native language interactions. So many great ideas, examples and resources were shared, it was pretty hard to keep up! If you’d like to read the whole discussion, check out the full transcript here. Also, we’d like to thank you for being a vital part of #langchat! Every week, we are pleasantly surprised each week to find out what wonderful suggestions and comments you have to share with us. If you have something specific you’d like to discuss, or just simply want to share your feelings about the topic at hand, please get involved on our forum page. We love to know how to better connect you with the wonderful #langchat PLN!